Iceland is known for its rugged beauty, dramatic terrain and a haunting vastness that entices every visitor. Most famous for the Northern Lights (AKA Aurora Borealis), this light show is considered one of the most beautiful natural phenomena in the world. People come from all over the globe for a chance to witness the ethereal green and pink lights twist and turn across the night sky. Good question. Let’s define this intense natural phenomenon as concisely as possible. The light displays we see on earth are initially caused by a storm on the sun. Powerful winds of charged solar particles reach earth and react with our planet’s magnetic field and atmosphere. When the charged sun particles hit the atoms and molecules surrounding the Earth, they light up. 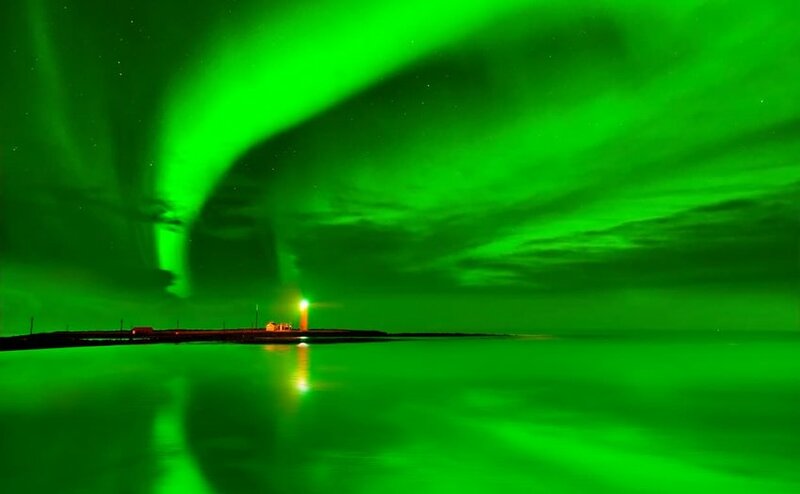 The location of the lights has to do with the Earth’s magnetic field, only making these lights visible from the north and south poles. 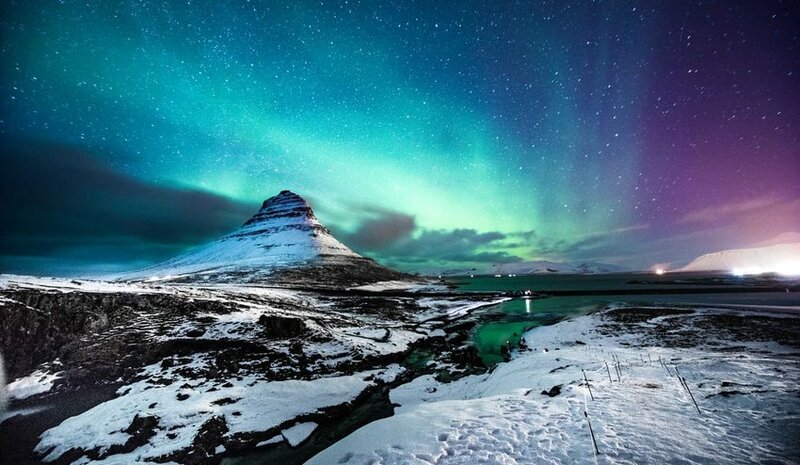 Because the south pole is must less accessible than the north, Iceland is one of the most popular countries from which to view the lights. You're likely to see the lights anywhere between September through April. However, the best chance for the most incredible shows is between the months of November and February. Yep, that means booking a trip to Iceland in the middle of winter. The cold weather creates a better chance for clear skies, and this is exactly what you want when sky-gazing. We know it sounds crazy, but wrap up in a parka and grab your gloves -- we promise you won’t be disappointed. It’s a misconception that Iceland is the only place to see the northern lights. They can actually be seen from Norway, Finland, Alaska, and parts of northern Canada. 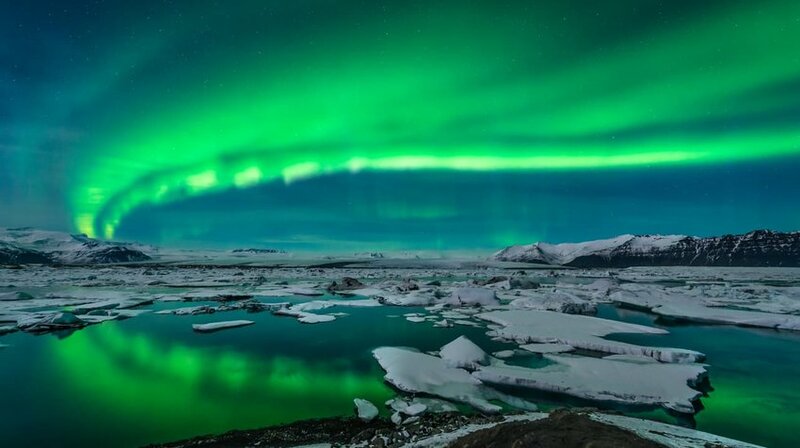 Yet these areas do not have as reliable weather conditions as Iceland, which is why this island nation is so synonymous with the world’s most famous natural light show. To start, book a flight to Reykjavik. If you’re not able to travel outside the city, don’t worry! There are places within Reykjavik you can easily access to see the lights! In fact, the gorgeous display is viewable from many different areas around the country. 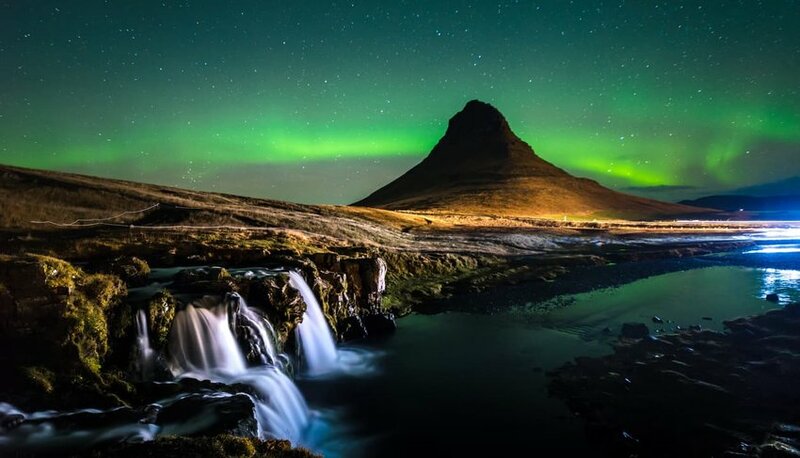 Just keep in mind the most impressive shows happen in areas of complete darkness, which is why the remote Icelandic countryside includes some of the most popular places to go. From Reykjavik (south): Carless in Iceland? No problem. The Grotta Lighthouse and Hljomskalagardur Park are your best bets for viewing the lights inside the city. If you can, rent a car to visit Thingvellir National Park, one hour away from the center of Reykjavik. This area is remote and the pitch-black sky makes it a safe bet for excellent viewing conditions. From the west: Calling all photographers! If you want a killer shot of the northern lights and an incredible backdrop, you’d better head west. The small villages of Akranes and Borgarnes on the Snæfellsnes Peninsula can offer a variety of backgrounds like the Snæfellsjökull Glacier, black sand beaches, and other unique rock formations and waterfalls. From the north: Want to see the northern lights and have an authentic Icelandic experience? Head north to Akureyri. The population here is spread thin across the sprawling landscape, creating an ideal viewing platform. The town itself is the second most populous in the country and has a thriving art scene, downtown boutique shops, and excellent restaurants. If you can get yourself to the north, you can have it all in one place. Read our Akureyri Edition for more tips! From the east: beat the crowds and head to the deserted east coast for a truly intimate experience. Dark areas away from city lights create a prime environment for viewing the northern lights. Not to mention, the serene silence of Iceland’s rural landscape is truly magical. Breiddalsvik, the tiny town of 139 people, or Jokulsarlon Lagoon are two of the best spots in the east. Adventure seekers looking to get off the beaten tourist track and away from pretty much every other person in Iceland, this is the place for you. Yes, seeing the Northern Lights comes with conditions. No matter how well you plan, there is no guarantee it will happen. However, there are the ways to improve your chances. 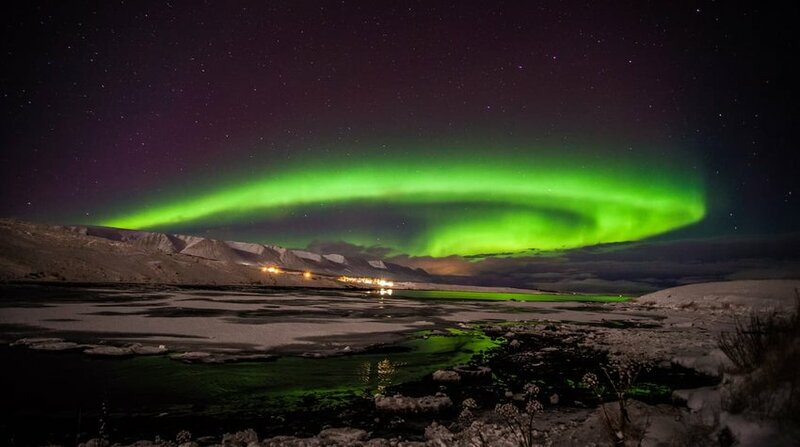 Be flexible with your trip itinerary – the longer you spend in Iceland, the greater your chances of seeing the lights! Go between the best viewing months of November to February. The night must be as dark as possible (a full moon will affect the aurora’s illumination). Leave “light pollution” behind (unnatural light – like from a city or residential area). Wait for little to no cloud cover. A few environmental factors need to come together in order to see the aurora. Even if you’ve done all of the above, if there is no solar activity, there are no lights to see. Be patient and keep trying! 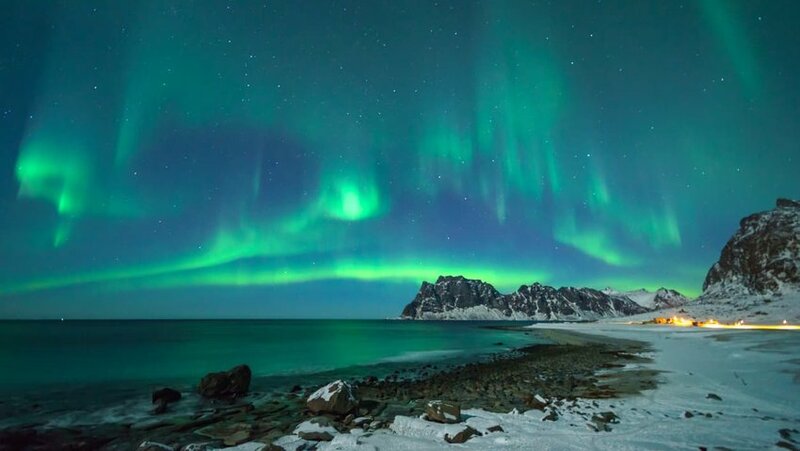 Now you’re fully equipped and informed on how to plan a Northern Lights vacation. So, get out there and see for yourself what all the fuss is about! Be sure to tag us on instagram @nowdiscovering when you post those stunning photos!